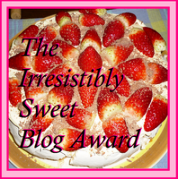 I am sooo excited to show you all my latest entry for a challenge that I have even stayed up a little later then usual just to finish it and post on my blog. The Challenge Blog site - Shopping Our Stash has their first challenge going which is to use either our oldest ribbon, use the colour that we have the most of or using a new technique that we don't usually do. And finally I went to my ribbon box which usually houses my most precious ribbons - the ones that Charlotte knows she is not allowed to touch! Fortunately for her I had already caught her brother earlier today pulling each ribbon out one by one and having such great fun. Argh kids! Got to love them! Anyway, I decided to go with my oldest ribbon - back in my high school days (dare I say over 20years ago now) I was very fond of wearing tartan or check ribbons in my ponytail! So now I have an abundance of these ribbons left over. I found a great pink & white check ribbon that would be perfect for one of those twisted flowers that seem to be the thing at the moment. I can't believe how nervous I was in regard to trying the flower - it really is so simple to do and a little bit contagious once I knew what I was doing. I went on to make two more. The final flower was made from velvet ribbon. It feels so cool to touch! Do I get extra credit for recycling ribbon too???? The green crinkle tissue ribbon that I used for the leaves was originally on a bunch of flowers that were given to my MIL - she then re-cycled it as a ribbon and bow on a present that she gave me - I made an engagement card for my 3rd BIL with it and used the final scrap on this card tonight. 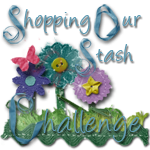 I had so much fun playing along in this challenge from the Shopping Our Stash ladies. 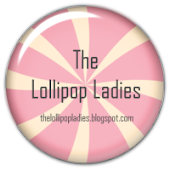 Definately worth popping by their blog and checking it out - I have a link on my right side bar if you want to visit have a look for yourself. I can't wait to see what they come up with for Challenge #2! Thanks for playing with us at SOS this week! OH WOW, Looks so awesome Kelly! Really came out swell, the rolled flower is great! Especially love it in the pink tartan, the card style is fabulous! What an exciting post!! I LOVE all of your ribbon stash and the gorgeous ribbon flowers you've made using some of it! Thanks for joining us over at SOS! for our 'Ribbon Rewind' Challenge this week. Wow you are the ribbon queen! LOVE your stash all in different spaces! And that card is just gorgeous...I need to make some more of those flowers. Fantastic job! Thanks for joining us at Shopping Our Stash! Your card is so lovely and I'm so happy that you shares pics of ALL your super pretty ribbon stash, too! This looks fantastic Kel! What great flowers! Enjoy the Big banana! They have some cute souvenirs.